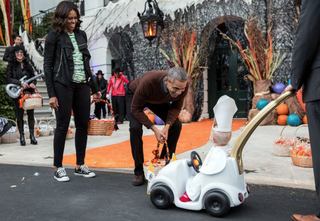 President Barack Obama and first lady Michelle Obama gush over “Lil' Pope,” who arrived at the White House Halloween party in his own miniature popemobile. From the mini pope at the White House to President Barack Obama and first lady Michelle Obama, some kids’ Halloween costumes this year were downright cute and creative, knocking the traditional Cinderella and Batman getups straight out of the box. Is this Drizzy way cuter than the original? Did you see others? Let us know in the comments.